Interestingly enough, our answering machine, flaky though it has been, did indeed come on, so we would have been able to tell by calling the house that the power was back. One message says “Hi, you’ve reached Jake and Cindy…” and the other says “Leave a message for Jake and Cindy…”, but more conclusively, one takes a # key to check messages, and the other takes a * key. But even if we hadn’t gotten the call, and hadn’t had our answering machine come up, my home computer still booted. It comes up and launches my webserver, which has some custom portal type apps I run for myself, and my mail spam filter system, which scrubs my IMAP account. Now I wasn’t sure if I’d be able to see the machine, since our DSL has a dynamic IP address, and I’m not sure that the app I use to update my dyndns.org record is working. 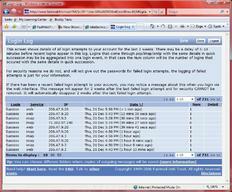 Interestingly enough though the screenshot above is the web interface to my Fastmail login log. 71.102.97.190 is the IP address of my computer at home, as logged in to my IMAP account to scrub spam. So now that I had my home machine’s IP address, a quick update of my dyndns.org DNS record, and I’m reconnected to the home network. Reboot complete. Now we just have to wait for the house to heat up, and it’ll be good as new, except for all the sawdust and bark chips I dragged in while feeding the wood stove last weekend. Phew. Very nearly an entire week out. Exciting, true, but I think we could do without this for another 10 years, and not feel we’re missing anything.